Restylane and Perlane (Restylane Lyft) are safe, natural cosmetic dermal fillers. They restore skin volume and fullness to smooth out wrinkles, reshape facial contours, and augment the lips. They can improve the appearance of a variety of wrinkles, including the nasolabial folds (smile lines) and marionette lines, and can enhance the eyes, lips, cheeks, chin and jaw line. Restylane and Perlane create a more healthy, youthful appearance by rejuvenating volume deficient areas. Restylane and Perlane are made of non-animal based hyaluronic acid, a sugar molecule found naturally in human skin. Once injected, the hyaluronic acid molecules attract water producing a soft, supple correction that looks very natural. Restylane is safe, with over 1.4 million treatments performed in the US. Since they are non-animal derived products there is minimal risk of infectious transmission or allergic reactions. Dr. Steiger performs Restylane and Perlane injections in the comfort of his office. Patients can return back to work immediately after treatment. A very small percentage of patients may develop redness or bruising. This typically resolves in several days, but can be covered. Results are visible immediately after treatment, and most patients appreciate 6 to 9 months of correction. The procedure can repeated as often as you wish. A private consultation with Dr. Steiger will help you determine which filler is ideal for you. Radiesse is a synthetic injectable filler used to fill in lines and wrinkles and reshape the facial contour. It can improve the appearance of a variety of wrinkles, including the nasolabial folds and marionette lines, and can enhance the eyes, cheeks, chin and jaw line. Radiesse can restore a healthy, youthful appearance, enhance your existing features, and increase your confidence- all without invasive surgery or scarring. Radiesse is made of calcium hydroxyapatite, which is a naturally occurring mineral in the human body. Since it is synthetic (not derived from human or animal tissue) there is no risk of infectious transmission. This unique injectable may also stimulate collagen growth, providing an initial plumping along with extended correction. Side effects such as swelling or bruising are minimal and should fade within a few days. Results are visible immediately after the injection and can last for months to years, although the procedure can be repeated as often as you wish. Dr. Steiger performs Radiesse treatments in his office, which typically take between fifteen to forty-five minutes to complete. Dr. Steiger uses injection techniques which minimize discomfort. A local or topical anesthetic may be also be administered for patient comfort before injection. Side effects such as swelling, redness or bruising are minimal and should fade within a few days. Work and other normal activities can be resumed immediately after treatment. Artefill and Bellafill are part of a newer class of facial fillers that are considered permanent. This long-lasting filler is made up of microspheres thate are not absorbed by the body. Over time, the Artefill microspheres provide support to the injected area and stimulate production of your body’s own collagen. Artefill microspheres are also combined with collagen in order easily deliver the product into the desired area. Since there is collagen within Artefill, a skin test is performed on your forearm, prior to using Artefill on the face. This skin test will assure that you have no allergy to the collagen and make Artefill safe for you. Dr. Steiger performs Artefill / Bellafill treatments in the comfort of our office treatment room. During your consultation he will help you determine if this is the right product for you. Dr. Steiger uses injection techniques which minimize discomfort. A local or topical anesthetic may be also be administered for patient comfort before injection. You may return to your normal schedule immediately after treatment. Juvederm is an injectable filler which can improve the appearance of deep facial wrinkles, folds, lines and acne scars, enhance the lips, and re-contour facial features. Juvederm is made of hyaluronic acid, a natural substance found in human skin. Hyaluronic acid bestows volume to the skin. Without it, the skin would appear dry, withered and wrinkled. As we age, our skin cells lose some of their ability to effectively produce hyaluronic acid. Juvederm treatments restore some of the lacking natural hyaluronic acid. The results are very natural and long-lasting, with the effect remaining for six months or longer. 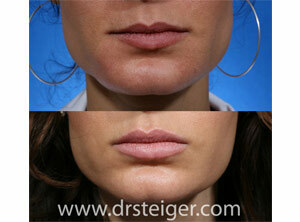 Dr. Steiger performs Juvederm treatments in the comfort of his office. Depending on the area being treated, the procedure can take as little as 10 minutes to as much as 45 minutes to complete. A topical numbing cream, local anesthetic, or nerve block may first be administered to maximize patient comfort. Juvederm has very few side effects. Some patients may experience redness or swelling at the injection site which can last for a few days. Nevertheless, work and other normal activities can be resumed immediately after treatment. Juvederm is a safe and effective injectable that can be used for all skin types and colors and does not require prior testing. During your private consultation, Dr. Steiger will help you determine which filler is best for you. Voluma is a newer injectable filler and facial volumizer that is used to improve fullness in the midface region. The midface area is where we first start to exhibit signs of aging as early as our 30’s. The falling midface/cheeks results in an older and a more tired appearance. Volume correction in this area is essential to maintain a more youthful appearance in the most natural ways. 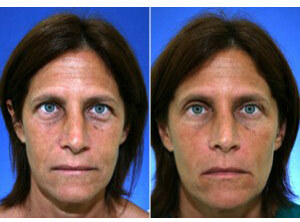 Voluma is commonly used for midface correction and to re-contour facial features. Voluma is a “thick” version of hyaluronic acid, a natural substance found in human skin. Voluma results are very natural and long-lasting, with the effect that can last for up to two years after injection. 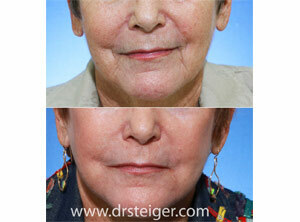 Dr. Steiger performs Voluma treatments in the comfort of our Boca Raton office. Depending on the area being treated, the procedure can take as little as 10 minutes to as much as 45 minutes to complete. A topical numbing cream, local anesthetic, or nerve block may first be administered to maximize patient comfort. Dr. Steiger will use his artistic eye and extensive facial plastic surgery knowledge to help you obtain the best possible and most natural filler results. Voluma has very few side effects. Some patients may experience redness or swelling around the injection sites which can last for a few days. Nevertheless, work and other normal activities can be resumed immediately after treatment. Voluma is safe in different skin types and colors and does not require prior testing. During your private consultation, Dr. Steiger will help you determine if Voluma is best for you. Sculptra is a cosmetic dermal filler designed to fill areas of fat loss beneath the skin. It is made of poly-L-lactic acid, a material which has been safely used in surgical suture for many years. Once Sculptra is injected, it initiates a response that results in skin thickening, improving the sunken appearance. Patients are reevaluated in several weeks to determine if further treatment is necessary. Several treatments may be required in order to achieve maximum benefit. Sculptra injections are performed in the comfort of Dr. Steiger’s office. The product must be prepared the day prior to injection, with treatments typically lasting 15 minutes. Clinical studies have shown that Sculptra can provide lasting volume enhancement for up to 2 years. A consultation with Dr. Steiger will help determine if Sculptra is right for you. Dr. Jacob D Steiger MD is a South Florida filler expert board certified by the American Board of Facial Plastic and Reconstructive Surgery and the American Board of Otolaryngology- Head & Neck Surgery. He practices in Boca Raton and Delray Beach, Florida treating patients from Palm Beach, Ft. Lauderdale, Miami, as well as patients from all over the US and from around the world.